US, 1970, 131 minutes, Colour. Arthur Hill, David Wayne, James Olson, Kate Reid, Paula Kelly. 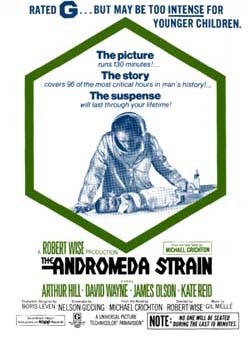 The Andromeda Strain is big-budget, widescreen, spectacular science fiction and enjoyable as such. However, despite all the trappings and the scientific data and jargon, the film is little more than a type of, It Came from Outer Space. The original novel was written by Michael Crichton, who wrote The Terminal Man and Westworld(which he also directed). 1. For whom was this film made? Younger or older audiences? 2. Interesting science fiction? Characteristics used and explored? Quality of production values? 3. The film is specifically moralising, especially at the end. Does this fit in with what precedes? is the warning valid? 4. Impact of the credit sequences? Scientific background, the staccato and warning aspect? The scientific plausibility for the audience? Structure, diary form, the flashbacks and flash forwards? The choosing of particular incidents with date and time to emphasize the urgency of the story? 5. Moral issues, especially germ warfare and the building up of the arsenal? The contriving of dangerous experiments for	defence? The distance between scientists' ideals and the	reality of human life? Moral comment on such experimentation? 6. The opening of the film? The dead city with people dead in the middle of their ordinary lives? The eeriness? The menace and danger? The fact that only an old man and a young baby were alive? Did this opening set the tone for the film? 7. Impressions of the Wildfire plant? The immediacy for the people being called to participate in it? The elaborate	precautions for disguise of the set up? The distance from civilization? The elaborate technology under the ground? The film's specific detailing of the Wildfire plant? How technically impressive was the filming of the Wildfire unit? 8. As real human beings? As representatives of various attitudes towards science? Jeremy Stone, the brains behind the plan? His decisiveness? The fact that he could leave home immediately? His influence and authority over the others? Ruth, as a woman, as a scientist? Her wisecracking and scepticism? Her scientific dedication? The fact that she concealed difficulties with epilepsy and her eyes? The human risk that she involved? Mark as a sceptical but ordinary hero? As the film's superhero? What impression did he make? His conversations with the recorded voice? Charles as the veteran scientist? More human? The fact that his life is threatened during the film? His response to this? Did they make an impressive team together? The impact of the long process of their decontamination and coming down to the various levels? 9. Were the sequences of the investigations and discoveries convincing? Why? Did the film have an aura of authentic scientific investigation, procedures, equipment etc? 10. The point of an old man and a baby surviving? The dramatic impact of the old man and his scepticism? The leads that these two people gave for investigations? Emotional response to these survivors? How did the tone of the film change when the President of America was involved? The advice that the President needed about curtailing the strain? The clash between politicians and scientists? The fact that the politicians prevailed and the scientists were persecuted? How ironic was this in view of all that happened? Points made about politics and science and decisions? 12. The dramatic impact of the crash and the disintegration of the rubber in the plane? How did this add dramatic tension to the investigations being shown? 13. How plausible was an Andromeda strain? Would people react to such a crisis as the people did in this film? The scientists as well as the politicians? The easy resource to bombing? The risks of bombing? 14. The nature of human error? The bell and the phone calls to Washington? Ruth's eyes and her missing the information? How strong was this message about the reality of human error? 15. Was the denouement melodramatic? Saturday matinee adventure? Ruth's epilepsy and the difficulties there? mark's heroic climb and the fact that he was being fired at? Did he have any alternative? Was this action climax filmed well? 17. Was the ending plausible? Optimistic in plot? Pessimistic in message? How pessimistic in its moral judgments on the people, the Wildfire plant, politics, germ warfare etc.? Was this a good film?